The Voice Interactive Alarm Clock uses "advanced speech recognition technology" to let you set the time and alarm with voice commands alone. This clever clock will respond to verbal queries like "What time is it?" Moshi, the manufacturer of the IVR Alarm Clock, claims that it is the first alarm clock that is voice responsive. It responds to a total of 12 voice commands. Just start your command with "Hello Moshi." This rather quaint alarm clock is the first step on the way to systems like the Daily Schedule in Frank Herbert's forgotten classic The Dosadi Experiment. 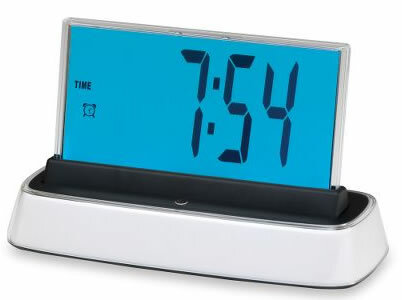 Take a look at four different clever alarm clocks that are determined to get you up!. From Gadget Reviews.